ONE DOWN - ONE TO GO ! Thanksgiving has come and gone for those of us in the U.S. who celebrate. I fear, however, that the pounds will remain attached to my hips forever! Next on our list here at Arthur Acres is Christmas. We are trying to gear up enough energy to start the tree decorating and get things out. With the years creeping in and family going separate ways we are putting out less and less each year. I love Christmas decorations but my stamina is blocking some of my enthusiasm. 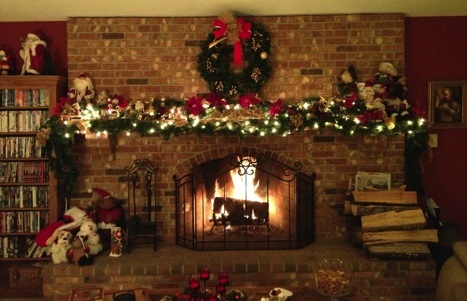 I do hope, however, that I can get my mantle in shape as I dearly love my fireplace and hubby keeps a fire going for me all the time that the weather permits (which for me is most of the time)! But there seems to be no lack of enthusiasm or excitement when it comes to our Online Mystery Classes, commissioned Stitch Guides, and model stitching in general. I actually begrudge getting tired and sleepy and needing to quit at days end. I suppose I might be addicted - you think? 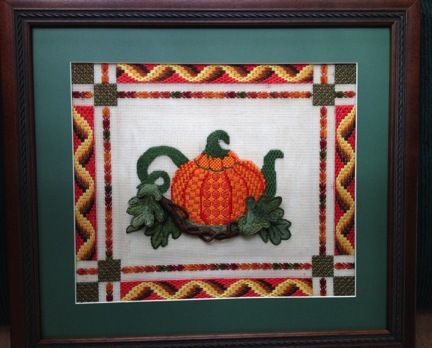 Great news for some of you class participants - I understand that ABC Stitch Therapy in Texas has all her canvases, etc., marked at 20% off through December 2. You might want to check if you do not have your canvas for any of the upcoming classes - she just might have it. If not, ask if the discount extends to items ordered - I do not know the answer to that but probably not as most sales are for inventory reduction at this time of year - http://www.abcstitch.com. Tell her you are needing it for a Sandy Arthur class. 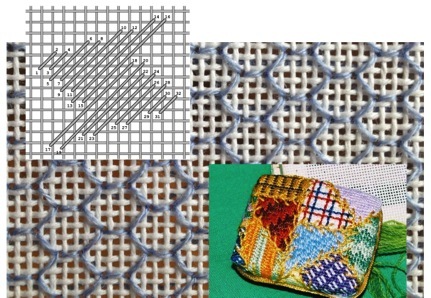 She also has most threads that the designs require because I picked up several when I was there a few weeks ago so you could share the materials list with her as well. Speaking of which - just a quick reminder that the next, upcoming new Online Mystery Class taking registration is the wonderful Brenda Stofft Easter Rabbit with Morning Glories - B-303. Stitches have been determined, threads have been selected, unique specialty beads are being distributed to those who asked, and actual model stitching is underway. It is always so exciting to start a new canvas! Remember I'm an addict! The invoices for this class have been/are being distributed. Payment is due December 15, 2015. The first class is scheduled to begin mid-January 2016 - I can't wait ! ! ! If you think you are signed up for this class and have not received an invoice, contact me right away at email duodesignsinc@yahoo.com as I may not have you listed. If you still want to sign up for this class, contact me right away at duodesignsinc@yahoo.com. There is still time. 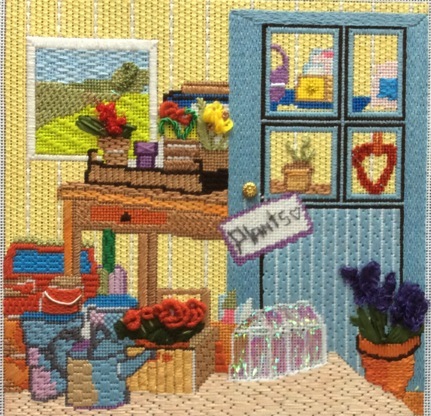 If you have not ordered your canvas now is the time to seriously consider doing so if you want to get it in time for the first lesson - it is very tight time wise at this point and you may have to wait a week or two to start stitching. If you want more particulars, email me at duodesignsinc@yahoo.com, or scroll down through the older posts here back several weeks and review the information. Also, with Thanksgiving just behind us, there has been some buzz about the upcoming class of the Melissa Shirley Thanksgiving Critters, which I refer to as Autumn Critters as it is not limited to Thanksgiving at all. Several new people are signing up for this class which is scheduled to begin mid-March 2016. Invoices will be sent out the first part of February 2016. If interested send me an email at duodesignsinc@yahoo.com. Lurking in the background is (or should that be are?) kit preparations. 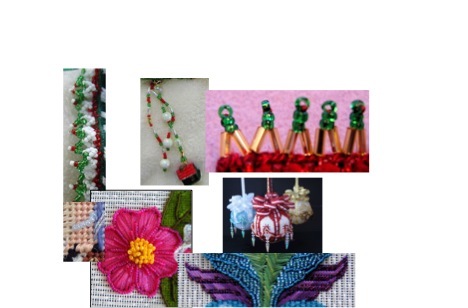 I am putting together kits for the TNNA Market San Diego, Callaway Gardens, Blue Bonnet Retreat, and ANG Oklahoma Chapter for January and February. It is hard to believe it is almost time! Here's some pictures of upcoming classes but I don't know how to line them up across the page in a pretty fashion - they just go where they want to go! Urgh! That's enough for today. 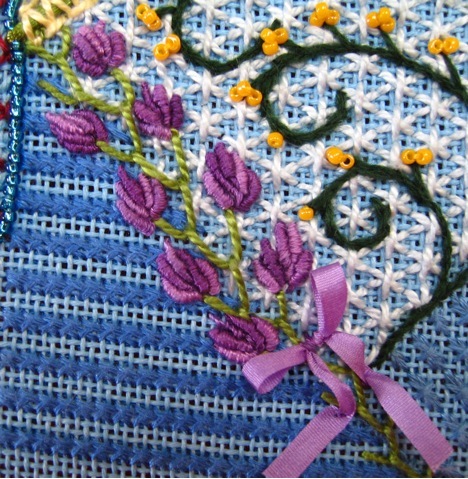 I must get back to stitching - and, yes, I do so with a smile - either physically or mentally. I continually am amazed at how quickly the Sundays (thankfully) come around. It is crisp and cold here in Central Kentucky and I woke up to snow on the ground! Not much, but snow is snow and it only means cold to me. However, I am also fortunate to have a beautiful fire burning in the wonderful fireplace! This past week has been quite 'unorganized' for a better word. I am working on a model for the TNNA Market class that I will be teaching in San Diego this coming January and it is a struggle. All my ideas aren't meshing as well as I had hoped and I have had to abandon some of my original thoughts. Cost of materials is another consideration - at least the way I think it is. So, I am trudging along getting my act together little by little. I posted Lesson 4 for the Beijing Butterfly Online Mystery Class this week. That does not seem possible that we are that far along! Only two more lessons to go and this beauty will be finished. 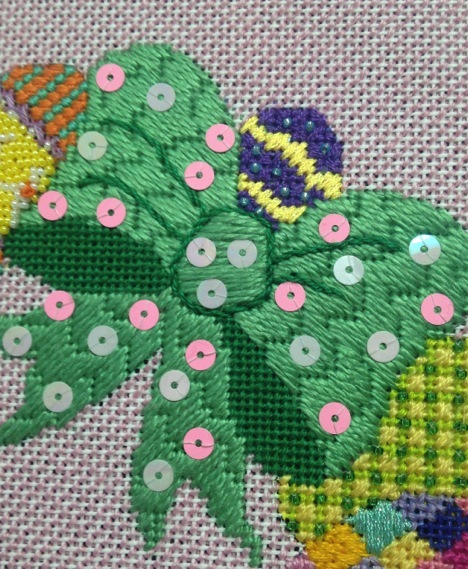 I also posted lesson 5 of Easter Wreath. The beautiful bow. 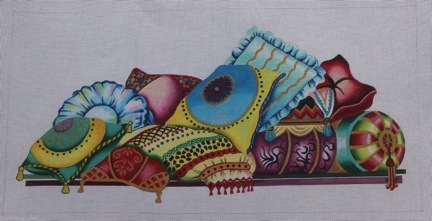 Bow after sequins added as painted on canvas. We only have one lesson left on this fun piece and it is a real climax! We will be needle felting the bunny! Can't wait to share that with my class. 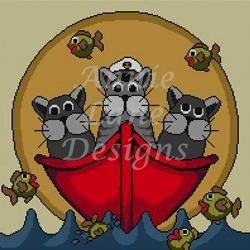 Then we began a new Online Mystery Class - Cats in a Dinghy by Annie Lane. Our first lesson involved the background and the sun. So fun to add the first stitches to a canvas. 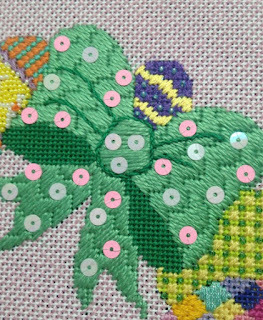 Now we are gearing up to get ready for our next Online Mystery Class - Easter Rabbit with Morning Glories by Brenda Stofft. His first lesson will be posted mid-January 2016. People are still registering and some have the canvas on their Christmas list - knowing that it won't arrive in time for the first lesson, but, hey, lessons are one month apart so there is no hurry. If you are interested in this class just send me an email to duodesignsinc@yahoo.com and I can answer your questions. 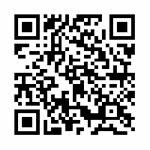 You can also scroll down through older postings here and get all kinds of info. And we have another S.O.S. 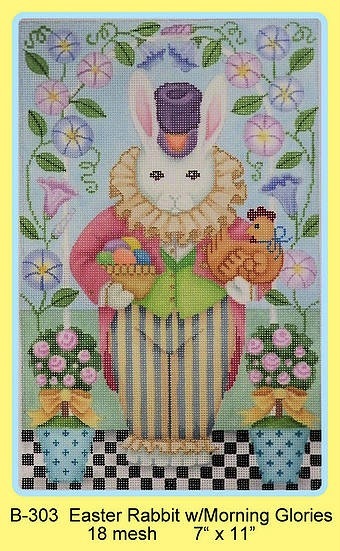 in Cyberspace scheduled; beautiful wreath from Melissa Prince, another Brenda Stofft Easter Rabbit; another Eye Candy fun piece; and on and on. If you have something special you would like for us to consider for an Online Mystery Class just let me know. If you have a few friends to add we will automatically offer a class for a commitment of 5 students and then open to more to join us. 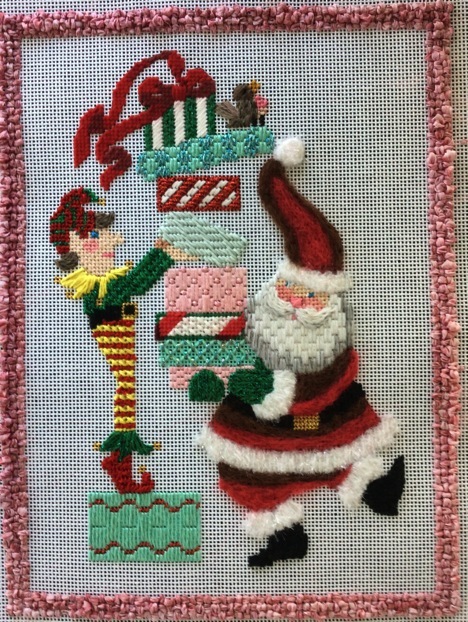 So, the fingers are very busy here and the needles are flying! My assistants are even blowing smoke from their needles! 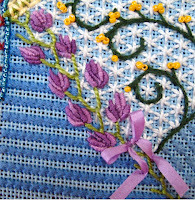 Have a great weekend and more later - in the meanwhile remember to Stitch with a Smile. First I want to express my sincere sympathy for all those directly affected by the horrible events in Paris! Words are so small but my heart is with you all. Since I visited with you last I had the enjoyment of participating in a class conducted by Pat Sone - Melissa Shirley 'Citrons'. This is a beautiful canvas and one that will work up quickly. 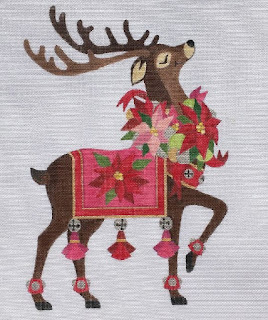 For those of you who may not know, as a Certified Senior Master Teacher through the American Needlepoint Guild we are required to keep up our CEUs so trying to work in a class can be a challenge to a busy schedule. When we do, however, it is always a joy. Be sure to take advantage of participating in this class if you have the opportunity! I haven't posted on Needlepoint Nation in awhile and I thought today would be a good day to do another recap. We launched our new Online Mystery Class - Cats in a Dingy by Annie Lane today. As always, I see such fun happening on this canvas. How can it not be a happy canvas with all those smiling fishes around? Lesson One covered the background and the sun to get students warmed up. We are well into our Easter Wreath and only have one lesson remaining. We covered the bow and the background this time. That leaves only the bunny but boy will he be a fantastic class! The last session is always a sad time for me, however, as I hate to let go. 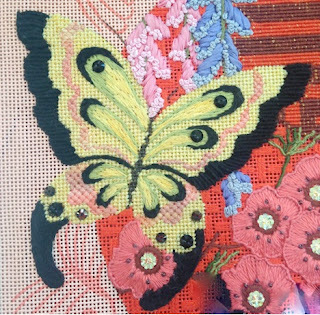 Beijing Butterflies is well on its way and we are mid-way through this piece. It is going to be so elegant and beautiful when completed. 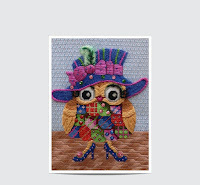 The online embellishment class - S.O.S. in Cyberspace - is also well on its way. We will start sharing the third session this week for this class. 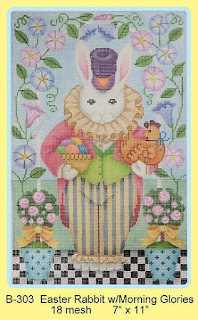 Current enrollment is active for the Online Mystery Class - Easter Rabbit with Morning Glories by Brenda Stofft. Next on the agenda will be the second series of the S.O.S. in Cyberspace for those of you who missed the first go around and wanted to do the next one. Registration is now open but the first session will not be posted until mid-February or mid-March. Just email me to put you on the notification list so that you will not miss out on this one. Also, some in the current grouping are wanting to re-up. Note: This class is limited to 15-20. I have so many exciting canvases to share with you that I can hardly contain myself. They are so beautiful and we will be so busy. You already know about the Melissa Shirley Thanksgiving (Autumn) Critters (mid-March 2016) and the fabulous Pillow Collage (mid-May 2016) but we have only scratched the surface. Be sure to get these canvases ordered right away! if you desire to have them for the first lesson. 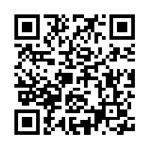 Email me with any questions and we'll be glad to answer as best we can. 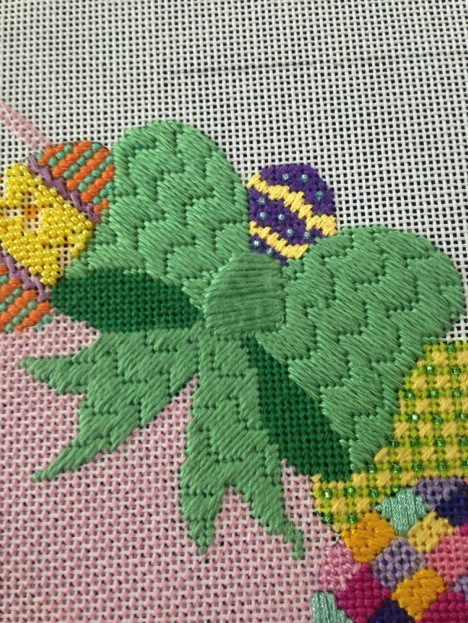 Have a great weekend in the meantime and remember to Stitch with a Smile! Well, EGA National Seminar was a delight. Students in both classes were new to me. We had such a wonderful time. And that made the time fly! I believe I have gained some new needle felting converts out of the process too. I've been working away gathering materials for the new upcoming Online Mystery Class - Easter Rabbit with Morning Glories. I am amazed at all the fun stuff I have chosen. We will be working with the fantastic Pepper Pot Silk, some lovely River Silks ribbon - different sizes, the straw silk that I love, gobs of different silks from Rainbow Gallery and others such as Vineyard Silk, lots of sparkly stuff, fuzzy stuff too, Bella Lusso wool, cotton, beads (some you may not have seen before), and much, much more. Techniques that might push your creativity some are included. We'll do ribbon embroidery, ruching, braiding, twisting, weaving, buttonholing, couching, padding, satin stitching, French knots, etc., etc. If you would like to join the fun, time is drawing short. Registration closes soon and the first class is scheduled to begin mid-January 2016. 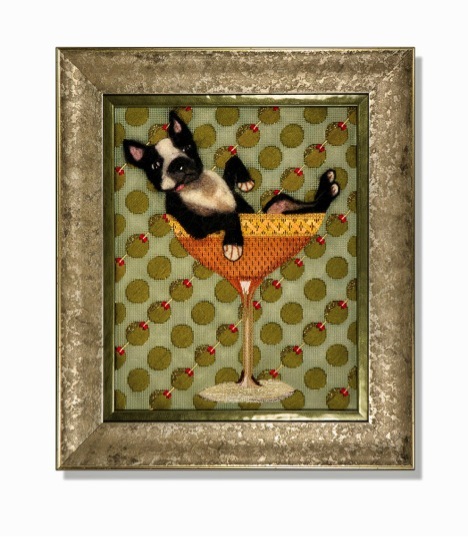 Don't miss out on this wonderful Brenda Stofft canvas. To register just send me an email at duodesignsinc@yahoo.com and we'll get you on the notification list for the upcoming invoice ready to proceed onward to the fantastic class date! The 'time-change' has occurred and I am in the process of trying to re-establish my inner clock. I'm sitting in my room at the EGA National Seminar in San Antonio where I am currently teaching a couple of classes, and my 'inner clock' is still on Kentucky time (one hour behind), and now I must re-adjust yet again to allow for the time change. So, while I'm thinking 7:30 am KY, 6:30 am Texas, it is actually now 5:30 am - urrrrgggghhhh. Oh well, it will all even out - just can't be late for class! I have had two delightful groups of students in my classes at the EGA Seminar. My first class was the Pumpkin Spiced Tea group. That is where I met Diana Card, a member of one of my current Online Mystery Classes - Beijing Butterflies. 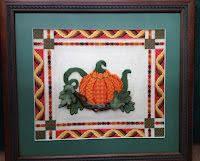 Pumpkin Spiced Tea is scheduled to be taught next at Callaway Gardens Needlearts Seminar (http://www.callawaygardens.com/events/education-and-culture/callaway-gardens-school-of-needle-arts) and Blue Bonnet Studio( http://bluebonnetstudio.com/retreat-classes/montue#307) Upcoming Seminars. Check 'em out! We'd love to have you join us in one of the classes. 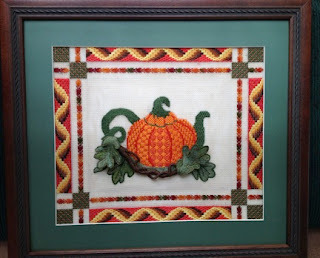 We cover some bargello techniques, needle felting, combination stitches, stump work, etc. Registration is now open for our next upcoming Online Mystery Class - Easter Rabbit with Morning Glories by Brenda Stofft. This guy is just chocked full of techniques and is going to be so much fun! Can you see the ribbon? rucking? beads? weaving? All kinds of possibilities! And of course, there will be dimension galore! The pretty Spring colors! Silks, wools, cottons, nylon, metallics - oh well, we'll just have to wait and see what transpires as we go along. The design area is 7" x 11" on 18 mesh canvas (my cut canvas size is 12" x 15" for stretcher bars). The teaching fee for this class is $150 for a 6-lesson packet which is invoiced through PayPal. Private group lessons are shared on a secret Facebook page controlled by me. 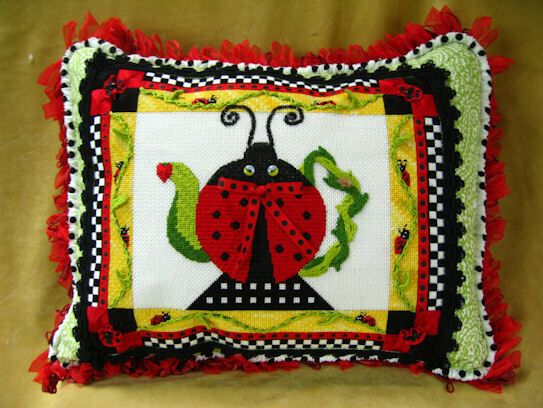 You are encouraged to purchase your canvas and threads from your local needlework shop. We are here to offer assistance when needed for obtaining these supplies. The invoices will be distributed by mid-December (some have requested being billed now and we are happy to accommodate - gets you away from some of those holiday expenses). The first lesson is scheduled for mid-January. 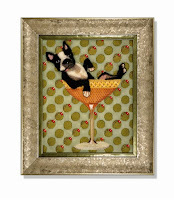 So, to join the group just drop me an email at duodesignsinc@yahoo.com and tell me you want in. I need your email address to be able to include you in the group and process the invoice. There are lots more fantastic classes in the future and you can pick up on more detailed information for them by scrolling down through previous postings here. Our S.O.S. 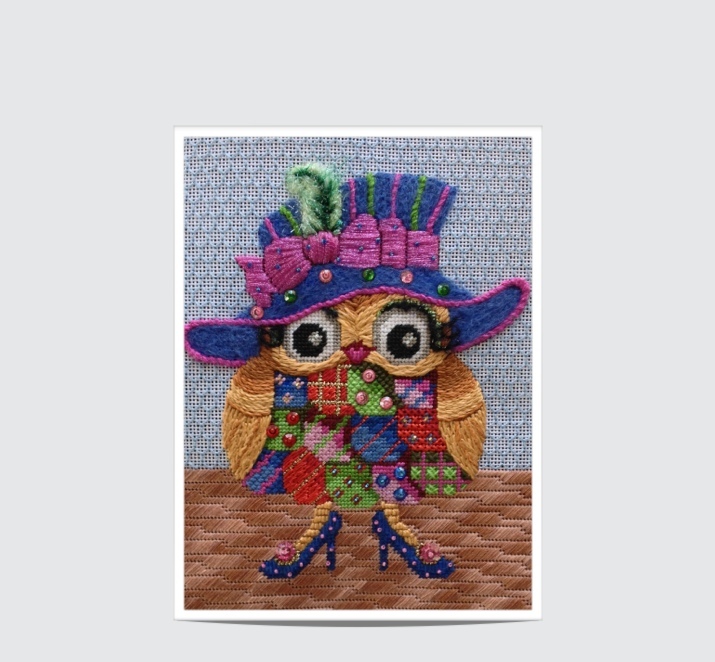 in Cyberspace (an online embellishment class) is lots of fun and covers a plethora of techniques, questions, canvases, etc. A second session will be following the current one so be sure to watch for that as well and let me know if you have an interest. That group is limited to 15 students. 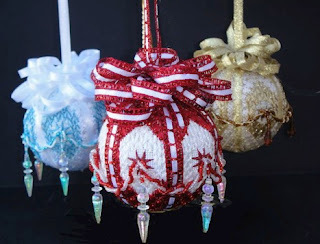 Well, the shower calls and I must get ready for my last day of class teaching the Trio of Diamonds ornament to a fantastic group of ladies. Have a wonderful weekend and always remember to stitch with a smile!